It’s not often that Cranky Betty and I get out of Northern England, so when we realised that we were going to be spending a weekend with friends in West London we decided it would be best to punctuate an otherwise relaxing weekend with a t rip to the ‘world renowned’ Swinley Forest in Berkshire. We had both heard about the quality of the trails there and to be honest we were just tired of riding in the still partially flooded northern provinces (‘beyond the wall’ if you’re from the South). Despite being somewhat hungover on a Sunday morning, thanks to a generous supply of Rum-filled pineapples the night before, we found it easy to navigate the M3 motorway and ‘The Lookout’ at Swinley Forest was relatively easy to find. It might be useful to note that there is a Sainsbury’s round the corner, so if like us you need to stock up several litres of Lucozade and mountains of flapjacks then you won’t be disappointed. Whilst £4 for more than 4 hours of car parking seems like daylight robbery to me, I am informed that this is in fact competitively priced for the area, so it probably isn’t so bad, plus there are lots of spaces. The café facilities seem pretty decent and the abundance of a type of outdoor furniture known as ‘benches’ suggests that the weather in the south is far better than it is up north (this was later confirmed by the arid state of the trails). Cranky Betty and I were feeling pretty rough (I don’t think I can overemphasise this) so we thought about just riding the 6.25 mile blue route, though in reality we were never going to settle for not giving the 8 mile red route a blast as well. The trails are all very well signposted and you really can’t get lost, even if you do there are so many riders out on the trails that inevitably someone will find you before you consider eating your camelbak. If you are a fan of rough technical terrain then Swinley probably won’t do it for you, to their credit the trails at Swinley Forest are very well groomed. The building crew behind the Blue and Red trails definitely deserve credit for squeezing the most out of the limited changes in elevation that the landscape allows. There are some ingenious uses of switchbacks to ensure that you can enjoy the descents for as long as possible, and some well-built and high-banked berms ensure you carry as much speed as possible. Don’t misunderstand me, you will definitely spend most of your time putting in pedal strokes at Swinley, but it never really feels like you’re having too pedal too long before hitting another interesting descent or feature. 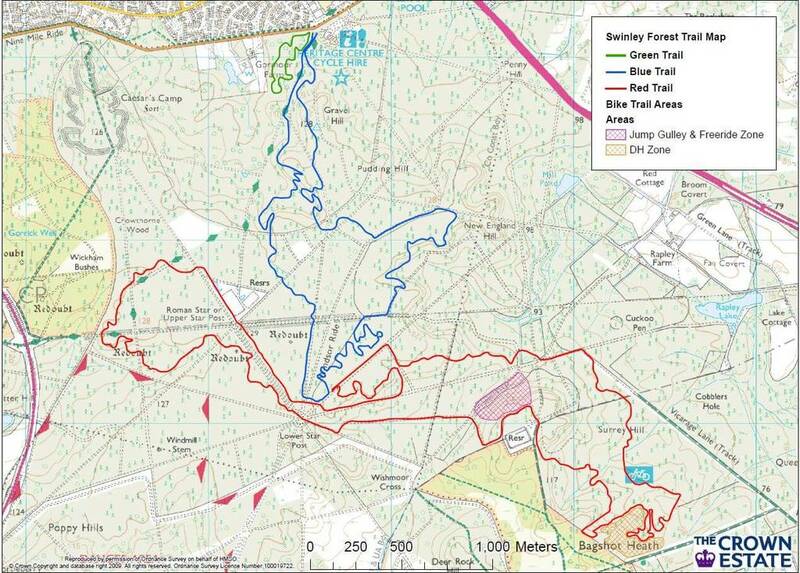 We noticed that from a technical perspective there didn’t seem to be much difference between the blue and red trails. There are some more aggressive descents on the red trail but, as long as you’re happy railing berms, climbing through root laden forest sections and sucking up the table tops you will get a lot of enjoyment out of completing both trails together. A particular enjoyable section for us was ‘Red 25’ which rewards riders who climb to the top with a fast flowing jump line (pump jumps and table tops are the order of the day) that leaves you wanting to come back and session it over and over again until you’re clearing everything at speed. The majority of the riders we saw (read: cycled past us) were either sporting the standard 160mm enduro bikes or 120/130mm trail bikes. In an ideal world a light short travel trail bike would probably be best suited to Swinley, as far as we saw all of the features were rollable and the terrain never really gets that rough (though as Stainburn Forest locals everything seems smooth compared to that rock garden!). Overall I would certainly recommend Swinley Forest, it is clear that the building crew have put a lot of time and effort into ensuring they get the most out of the landscape. 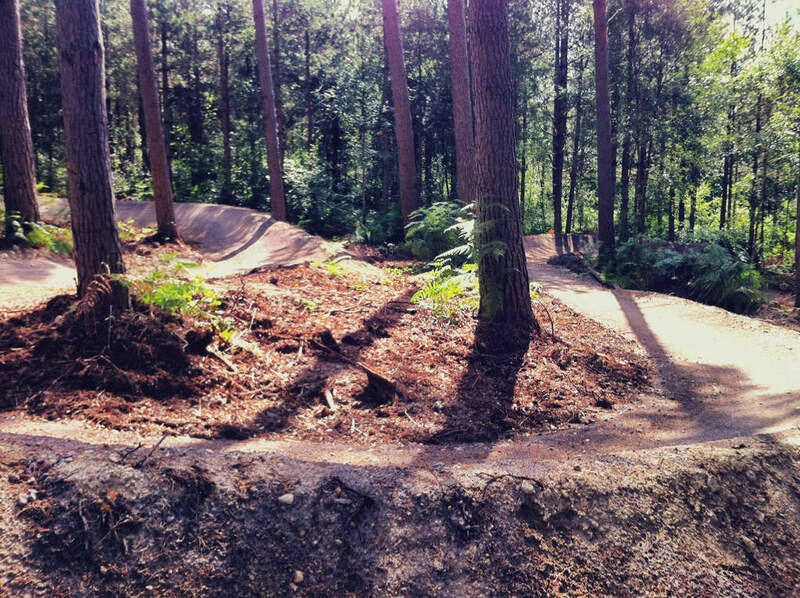 It wont be to everyone’s tastes, particularly if you’re looking for World Cup standard downhill runs or purely natural trails, but there are far worse ways to spend a few hours at weekend, and with its close proximity to London it will undoubtedly remain a popular trail destination for weekend warriors for years to come.